Misspelled words can undermine the credibility of a map. 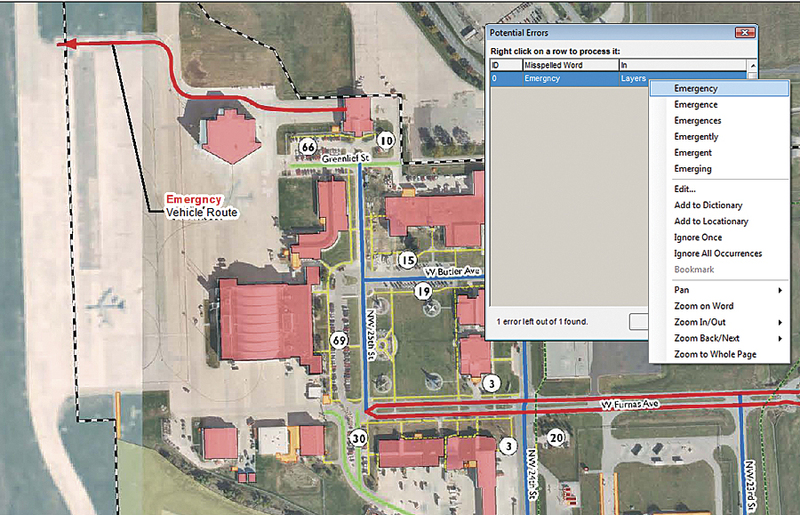 HDR uses Edgetech America's extension for ArcGIS to spell-check GIS objects, dynamic text, and format/XML tags. MapSpeller corrects all text added in-house to HDR's maps. Errors in maps cast doubt on their reliability and undermine the professionalism of the mapmaker. Plus, errors can be costly. One of the most insidious types of errors that can plague maps is the common misspelled word. There are as many reasons for not catching misspellings as there are steps in the map production process. Yet, there is no doubt that when you see the name of your city misspelled on a map, your reaction is visceral. The HDR spell-checking process now reports potential errors in a dialog box, one error per row. Users can then interact with and fix errors directly from the dialog box. Some forward-thinking companies clearly understand this. One such company is Esri's Gold Tier Partner, Omaha-based HDR Inc. Founded in 1917, HDR is a top-ranked, award-winning architectural, engineering, and consulting firm that has realized projects in all the states and more than 60 countries. It serves diverse clients out of more than 185 locations with a staff of more than 8,000. Over the past quarter century, HDR has built a solid reputation for its GIS work, including defense projects serving the US Navy, Marine Corps, Army, Air Force, Coast Guard, and National Guard worldwide. 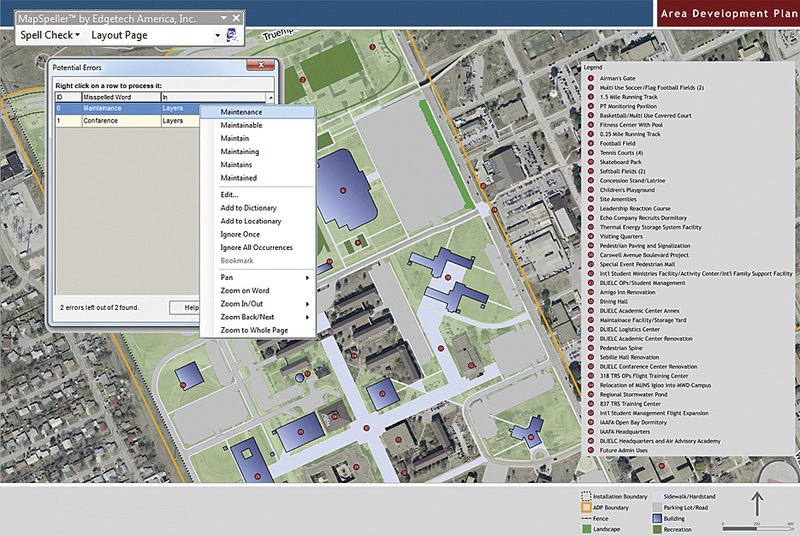 The creation of maps is an important and highly visible portion of HDR's deliverables, whether in design, environmental restoration or planning, cadastral mapping, meeting the documentation provisions of the National Environmental Protection Act (NEPA), or managing cultural or environmental resources for these military clients. The firm does a heavy volume of GIS work and, to that end, employs approximately 80 GIS professionals. HDR has been using ArcGIS for this work for years. Once complete, maps are incorporated into books and reports destined for either print or PDF. The emphasis is on accuracy, cost-effectiveness, and a professional image, all of which are qualities of high importance to both HDR and its clients. Misspelled words can undermine those qualities and threaten any product bearing even minimal text. If a spelling error is made in a printed map, HDR would have to produce an errata sheet or even reprint the report. For digital maps, HDR would still need to produce and distribute corrected versions, and the client would have to replace the incorrect versions. This can be very time-consuming and expensive. In addition to budget problems, deadlines may be missed, the credibility of the document is damaged, and the images of producer and client suffer. "Most of our mapping products are integral to larger published reports that are disseminated among high-level decision makers throughout all branches of the US Department of Defense," says Joe Gunning, a senior GIS analyst with HDR Engineering, Inc., at its Colorado Springs location. "Some of our reports are also subject to congressional review. Spelling errors are simply not tolerated by our clientele, so we were obligated to spend many QA/QC hours tracking down every typo, misspelling, and transposed letter." These were the driving forces behind HDR's search for a spell-check program that works reliably in the ArcMap application of Esri's ArcGIS. GIS managers at HDR sought a robust solution that would correct all text added in-house to maps, evolve with ArcGIS for Desktop and HDR's own needs, and be fully supported by its developer. 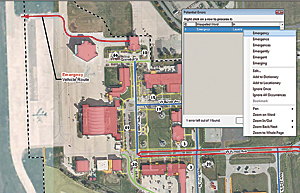 Alyssa Martin, GIS manager with HDR Engineering, began the process of evaluating spell-check solutions and chose MapSpeller from Esri Silver Tier Partner Edgetech America, Inc., of Glen Allen, Virginia. Without leaving the dialog box, HDR's GIS staff can zoom and pan around a page layout to analyze the word in context and then fix, edit, ignore, or bookmark it or add it to a dictionary. MapSpeller corrects text in most types of GIS objects, including map, layout, and geodatabase annotations; grouped graphics; legends; layer labels; scale objects; and tables. It understands maps and the specificity of proofing ArcGIS objects, including the behavior of dynamic text and how ArcMap format/XML tags can be used. "Our testing proved it to be exactly what we needed," Gunning says. "Reliability and ease of use are hallmarks of the software. The ability to customize dictionaries is a powerful feature in our world of acronyms and specialized nomenclature." Says Jason Smiley, the geospatial business class manager and federal GIS coordinator at HDR Environmental, Operations and Construction, Inc., "Map production often includes many small labels that are not always easy to review, which leads to missing spelling errors. Our old process involved having project managers review maps after a GIS team review, and there were always missed spelling errors even with multiple reviewers. Now we just run the spell-checker before sending map products to project managers so we don't require manual reviews of every label on a map." Automated proofreading and correcting should be part of any mapmaking process, according to Smiley. "After looking at a few maps manually, they all start looking the same, which dulls the user's acuity for spotting typos." Even when they are detected early, errors may be time-consuming to fix manually. For example, they may be several levels down (in the case of grouped graphics) or stored in tables (in the case of layer labels or geodatabase annotations). "Mapmaking can be tedious work," says Martin, "and we don't zoom in and look at every single thing we're changing. In addition to just keystroking in text, we regularly have to translate from 'GIS-speak' to normal English. We're creating aesthetically pleasing products and have to change the names all the time. The feature class name in a geodatabase might be something like STRUCTURE_EXISTING_AREA, but in the legend, you want to change it to Building or Facility." Done by hand, this tedious process invites errors. The software comes with a variety of dictionaries but also accepts customized ones, so Martin built two and shared them with her team. One wades through many military acronyms and specialized words so they don't appear as false hits in searches; the other catches commonly mistaken word substitutes, such as "solider" for "soldier." Bland Crowder is an editor and freelance writer in Richmond, Virginia. He can be reached at blandcrowder@comcast.net. For more information, contact Alyssa Martin, GIS manager, HDR Engineering, Inc. (tel. : 719-272-8800, web: www.hdrinc.com); Jason Smiley, geospatial business class manager, federal GIS coordinator, HDR Environmental, Operations and Construction, Inc. (tel. : 303-754-4200, web: www.hdrinc.com); or Denis Roose, president, Edgetech America, Inc. (tel. : 888-334-3832, web: www.edgetech-us.com).